There's been a lot to write about this week, and I've envisioned posts about several different topics for this morning. March is a long month, and I will be taking the annual Slice of Life Challenge. I'm sure all of my ideas will have their moments in the writing spotlight. This morning's post goes to the Patriots. 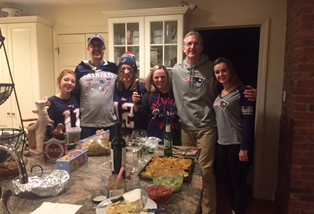 We are Patriots fans, so there was a lot to love about the 51st Super Bowl. We began the night excited and looking forward to great food and a great game. Like many fans, we are superstitious about our game day behavior, and we always watch with the same friends. We had our traditional food spread, our garb, and our cocktails. We were ready. We weren't ready for the first half, though. Given our tradition of sipping Limoncello whenever the Patriots score a touchdown, our bottle remained unopened. By halftime, the fun factor was way down, the commercials were disappointing, and our daughter in Italy texted that it was 4 am and she was going to bed. "She can't give up," Bill said. "There's plenty of time left." I also really admired the reflections of Lance Salyers who wrote about the Patriots in Forbes Magazine on Monday morning, and you can find his reflections here. 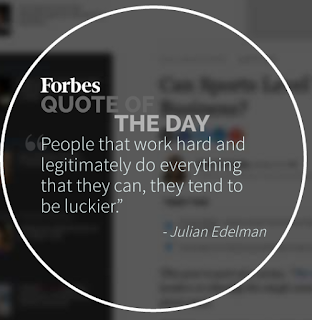 I'm sharing a screenshot of the Forbes Magazine's quote of the day from Receiver Julian Edelman. Edelman caught a pass in the fourth quarter that defied all odds and started the rally that led to one of the most amazing comebacks we'll ever see. 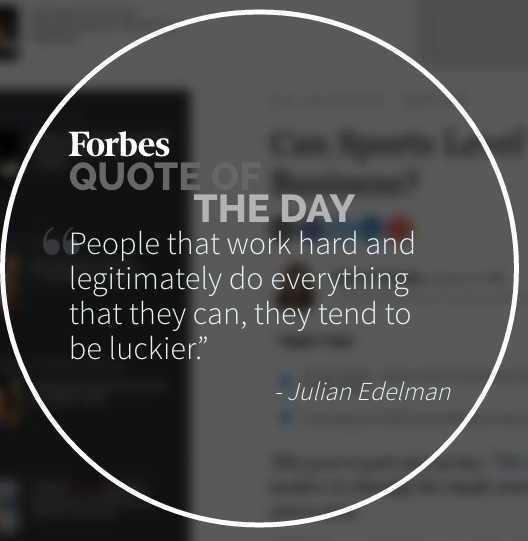 No question that the lessons from the result of the Super Bowl span well beyond the football field. The Patriots did make the game interesting. Determination can get the job done, even when the experts say no one has ever done this thing before. Congrats to the Patriots! Melanie, I like the point of your post today. Lessons learned from the Super Bowl is something I never thought about but it makes sense since they were the comeback kids of the night. Resilience is a skill that we should all promote in the classroom because look at the rewards that the Patriots reaped at the end. This was a really exciting Super Bowl. We are in sync in our posts -- I wished we lived closer to each other. I called Tammy the next morning and said, "I know you don't love football, but you have to watch the highlights - it really is a story of growth mindset and resilience." It was an amazing night!